· Designed for use with 28”h x 22”w polystyrene. · For use with double-sided displays. · Stylish curved design adds an impact to your prints. · Non glare overlays included to help maximize visibility. 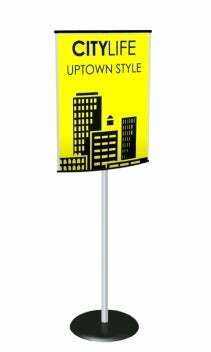 · Perfect for exhibits, retail, restaurants, trade show, and malls. · Stands 66 inches tall. · 16” curved steel round base reduces tripping.